Thinking Green? Pink and White Can Help! Inspiration Board. If green is your favorite color, pairing it with a dusty pink and traditional white can be quite stunning. It can be a great choice with any color combination “ just look at your lovely flowers, which are always wearing a shade of green. A beautiful way to infuse pink without looking too feminine is by pairing it with a hearty green color. 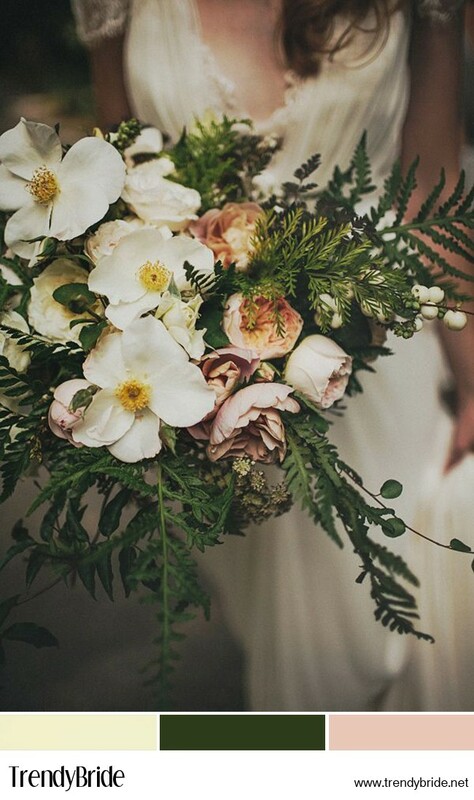 Using substantial greenery, or evergreen at a winter wedding, can be the perfect way to set off the pink and white. A bride can use soft white and pink roses in her arrangements or opt for magnolias with large, waxy leaves. Pink and white candles with flowers and ferns can hang down atop white and pink table linens. Take some inspiration from nature when it comes to using such a verdant color and the pink and white will take care of themselves. White has long been associated with weddings and pink is a favorite among many. By utilizing green, it meshes all the details together to create a timeless effect.